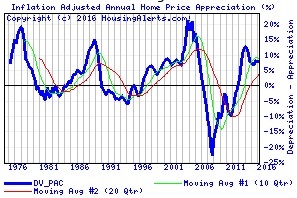 Charts showing the annual appreciation or decline in real estate values over time are visual snapshots of Supply & Demand forces in action. Technical Analysis (TA) relies on these charts because they accurately reflect what ACTUALLY happened. ANY and ALL Fundamental factors that can and did influence real estate values in THAT market, for THAT time period are ALREADY reflected in the chart. Other Fundamental factors that did not influence prices in THAT market for THAT time period are, by definition, excluded. The practice of TA consists of what are called “Studies” – different sets of calculations and algorithms proven over time. These Studies include Market Psychology, the most powerful driver of all. Because real estate is so cyclical (compared to the Stock Market, for example), relatively simple Studies can be used to accurately track local markets.